Yesterday’s win gave the M’s about a 5 percentage point boost in playoff odds, as it not only knocked the Astros back a game, but it was paired with a Blue Jays loss. That M’s game essentially came at the expense of Toronto, who saw their own odds drop from about 66% to 61%. That’s still an enviable position, but the M’s have a chance here to make up the gap: the Jays have a 2 game lead as this 3 game set kicks off. A sweep would radically change the race, given that we’re now about 2 weeks away from the end of the season. It coincides with the Astros facing off with the A’s, so losing the series may see the M’s go from tied-for-3rd in the WC standings down to 4th or even 5th. This is clearly Taijuan Walker’s biggest start, and thanks to his dominant performance against the Angels, I’m less concerned about that than I would’ve been a few weeks ago. To be clear: the Blue Jays are a much better offense than Anaheim, and Walker’s gem came after a string of dismal starts. If you want to feel pessimistic about tonight’s game, you’ve got plenty of ammo. Still – they’re a better club against left-handed pitching, and old scouting reports on Walker may be less useful now. Whatever Walker does, the M’s need to score some runs. They faced two crafty right-handed batters who don’t mind pitching up in the zone and allowing elevated contact, and they looked awful doing it. Tonight, of course, they face another crafty right-handed change-of-speed guy who pitches up in the zone. And it’s not just a matter of fly ball pitches flummoxing the fly ball hitting M’s offense (they’ve been fine against them overall on the year) – the problem is that the M’s offense has slowed down considerably in the second half. As the weather’s gotten warmer, the M’s ISO has fallen from .181 to .159, and their wRC+ has dropped from 110 to 102. They’re still OK (on offense – the defense is still atrocious), but a 110 wRC+ can paper over some things on the pitching-and-defense side of the ball a lot better than an essentially league-average offense can. Let’s hope Seth Smith – long one of the M’s streakiest hitters – stays hot. Marco Estrada is a remarkable pitcher, fashioning himself into an All-Star in a ballpark that seems so ill-suited to him. He throws a rising fastball (it gets more vertical movement than any other starter in the game) in the middle and up in the zone, and actively courts fly ball contact. That approach – and the movement he gets on his fastball – allows him to generate above-average strikeouts despite velocity that’s now in the mid-high 80s; his average fastball this year of 88.9mph ranks 2nd slowest in MLB among those who’ve thrown at least 1,000 four-seamers this year. In Milwaukee, he gave up tons of home runs and struggled to consistently gain the benefit of a profile like this, namely, a low BABIP (lots of fly balls and pop-ups = low BABIP). Something changed when he moved to Toronto, though. Yes, last year’s phenomenal year was driven in large part by an unsustainable .216 BABIP. But it’s regressed only as far as .241, giving him three straight years and over 450 IP with a low (.257 was the high mark) BABIP. The M’s need home runs. Of course, Estrada still gives up plenty. He yielded 24 last year, and he’s already at 22 this year, and he, like so many others, may not have cottoned on to the fact that Safeco’s playing like a launching pad this year. The Great Lakes Loons beat Clinton to lift the Midwest League championship trophy, so the season’s officially over in the M’s system. 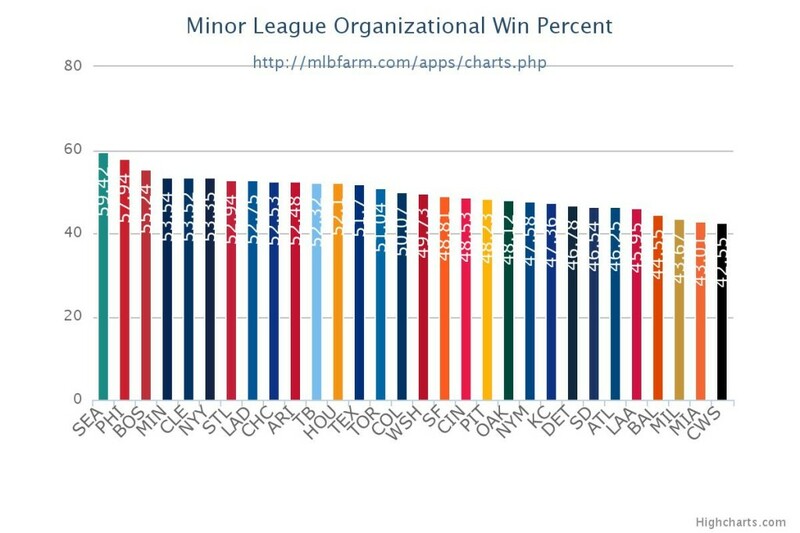 We’ve talked at length about the M’s disastrous 2015, so it’s only fitting to close it out with this chart, showing the M’s leading all of baseball with a minor league winning percentage of 59.4%. This will never stop being astonishing to me, especially given what happened a year ago. Is this a sign that the M’s farm system is a lot better than people think? Not exactly; you can win in the minors without blue-chip prospects. But it IS a sign that the front office’s talk about changing habits and building a winning culture was more than nice-sounding pabulum. Something’s going on. Well, this is odd. Somehow thousands of Canucks climbed the wall, or made their way under tunnels, to infect Safeco with their obnoxious accents and ear-splitting shrills anytime anything Jay-ish occurs. But at least Walker didn’t completely melt down after that 2 run blast–which was clearly fueled by Molson and vinegar fries. it would be very appreciated if our OFFENSE WOULD WAKE THE F**K UP!!!!! Ok, the Blue Jays have had their freebies. Time to get serious now. Hits. Where are the goddamn hits!! Awesome No Hitter going tonight!!!! Glad I’m not watching. Where’s o’Malley? Did he piss someone off? Boy, Saunders has had a crappy couple of months. I wonder if he’s hurt? OK, I get that I don’t exactly get this team. But when they have these types of games, I just stare. Estrada pitched a heckuva game. It happens. Really need the next two now. Fortunately the Mariners are about 57-0 in games that will ‘end their season’s hopes’ this year.